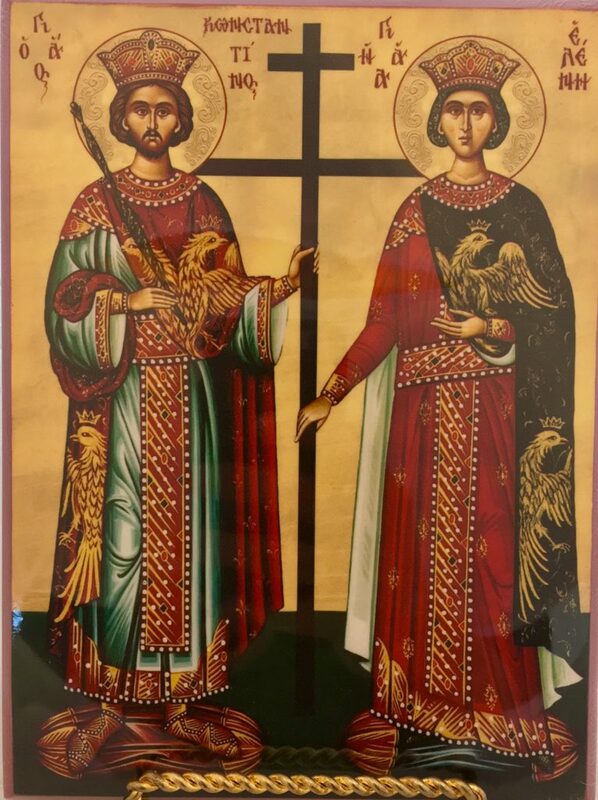 Constantine and his mother Helena. Like an architect, Constantine built up the Church greatly. He was born on February 27, 272 A.D. in Naisus, Serbia, which was part of the Roman Empire. Constantine’s father was one of the four caesars of the empire’s vast lands. Wanting to be like his powerful dad, Constantine would emerge as a politician, too. Although, his mother came from humble beginnings, she influenced Constantine on Christian beliefs. Because of the impression his parents made upon him, Constantine became a prestigious leader of both Rome and Christianity. When he became Supreme Augustus, Constantine used his power to spread Christianity all over the civilized world. In 302 A.D., Diocletian abdicated the throne. There were numerous civil wars, and there was chaos between caesars because they were all vying for authority over the colossal Roman Empire. In 312 A.D., Constantine fought the bloody and brutal Battle of Milvian Bridge against his rival Maximius. Some historians claim he was told in a vision that he needed to be the guardian of Christians. Constantine saw “XP,” which are the first two letter in the Greek word for Jesus, and he also saw “Hoc Vince.” That means “Conquer by the Cross.” Constantine’s soldiers painted crosses on their shields and he easily defeated Maximius. Impressively, Constantine conquered other kings and huge armies. It took Constantine 18 years and a series of battles and wars to finally become Augustus of the East and West parts of the empire in 324 A.D. He fashioned extravagant landscapes and nicely made roads, and protected many Christian kingdoms. Constructing beautiful cities, Constantine often used his own money and manufactured churches as shrines to Christianity. He established a new capitol, which was an old Greek city called Byzantium, rebuilt it, and called it “Nea Roma.” But after his death, this majestic city’s name was changed to “Constantinople.” Even though Constantine used much of his political power to advance himself, he also helped Christians significantly. Constantine’s faith evolved over the passing years. Constantine’s mother, who found the true cross and is an honored saint in the Orthodox and Catholic churches, was an immense Christian influence on him. She was also the first Christian pilgrim and was extremely devout. Constantine was politically careful about his faith. If he declared “I love Christians!” everyone would kill all the Christians and there wouldn’t be any today. Patiently, he waited till he was Supreme Augustus to proclaim his Christianity, but he still played it safe. Making it the law that Christians had to be accepted into society, Constantine created the Edict of Toleration in 311 A.D. The caesar Galatius ignored it. Because of this, Constantine implemented the Edict of Milan, which legalized Christianity in 311 and returned all stolen church property. Constantine organized the Council of Nicea in 325 to close pagan temples. While Constantine was pro-Christian, he didn’t get baptized until his death bed. He died on May 22. The year was 337. He was 65 years old. Although it took him a while to get there, Constantine was the first Roman emperor to convert to Christianity. Truly, if Constantine hadn’t supported Christians, there would be a lot fewer today. Constantine instituted Sunday as a day of worship. He dealt with schisms, and he called the First Ecumenical Council, which is where people come together to call out corrupt teachings and to decide what important beliefs Christians should have. It also deftly destroyed the popular heresy of Arianism. Arius taught that there was no Trinity. That God is Father. But Jesus is inferior. Father and Son aren’t equal. At the Council, Constantine remarked, “For my own part, I hold any sedition within the Church of God as formidable as any war or battle, and more difficult still to bring to an end. I’m consequently more opposed to it than anything else.” That meant that the fighting for true Christian doctrine at the Council was as hard to do as the work of soldiers and was also as momentous. The Ecumenical Council also produced the Nicene Creed, which is a creed we still sing today, and another name for this special gathering is the Council of Nicea. In the Orthodox Church we still sing hymns to Constantine and his mother. Because he promoted Christianity, his saint title is “Equal to the Apostles.” Constantine preserved peace and the faith for the ages. Constantine the Great was an adroit military man and politician, who also revered Christ. Although, he was a Christian, his faith progressed slowly over the years but he was cautious. Seriously, Constantine’s legacy as a resolute leader made the Church more durable. Without him, who knows what Christianiaty would be like today? Constantine was a Christian warrior. This entry was posted in Gabriel, Homeschooling by reba. Bookmark the permalink.